This sounds an awful lot like the thing you've been trying to STOP. And so the pieces have fallen into place. From the information put forward in this chapter, I have a fairly good idea of how the next few chapters will go. According to Ganta, his Branch of Sin, which is what Hagire wanted in order to release the seal on the Wretched Egg, is also the one thing that can strengthen the seal. Based on this, he’s decided the best course of action is to plug his ability into the Mother Goose system and hope really hard that he can bring Shiro back, rather than accidentally unleash a walking natural disaster. And based on the look on his face in that panel, he’s pretty confident that this plan is in no way stupid or reckless. Those of you who can understand all the terms I just used are probably aware that this isn’t the best course of action. However, it does seem to be where the story is currently headed. From my understanding, there’s no reason for the story to take any other path. The problem is what happens after Ganta reaches the Mother Goose system. In my mind I’m picturing a dial with two unmarked settings. One leads to a good end, and the other to a bad one. Ganta reaching that dial is as far as I can plan ahead, but I’m not sure which ending he’s going to get. This is the sort of series that could have any kind of ending. The incredibly dark subject matter suggests that a bad ending is all but inevitable, but the large number of characters that have survived up to this point suggest that the ending will be more upbeat, even if it’s still somewhat somber. I highly doubt the ending will be 100% happy, but at the same time I worry that it will try to be as dark as possible. There’s a particular pet peeve of mine where a series can become so dark that it becomes highly predictable, which can easily ruin any tension the series can have. So it’s less about a sad or happy ending and more about sad or bittersweet. At the same time, I wonder if simply having everything work out in Ganta’s plan could result in that bittersweet ending anyway. If Ganta defeats Hagire’s plan and gets Shiro back, then what exactly is waiting for him afterward? He has no family to welcome him in or friends to go back to. This chapter even implied that his health is rapidly deteriorating, so it’s not like he has the most promising future ahead of him. When you think of it like that, having Ganta succeed here isn’t outside the realm of possibility. Of course this means the best and worst endings aren’t that different, which does hurt the dramatic tension quite a bit. I’m learning more and more that these kinds of series aren’t meant for me. Whether you’re religiously upbeat or religiously dark, the issues of being predictable and underwhelming are essentially the same, though at least the upbeat shows don’t seem smug about the tone they set. Whatever the case, I’ve made it this far and I would like to see how things wrap up, even if it’s not likely to make me burst into tears. You know, looking at the series like this, I think I’m beginning to understand why so many people talk smack about it. Posted on January 30, 2012, in Chapter Discussions, Deadman Wonderland, Series and tagged bad end, bittersweet ending, Deadman Wonderland, manga, seinen. Bookmark the permalink. 10 Comments. 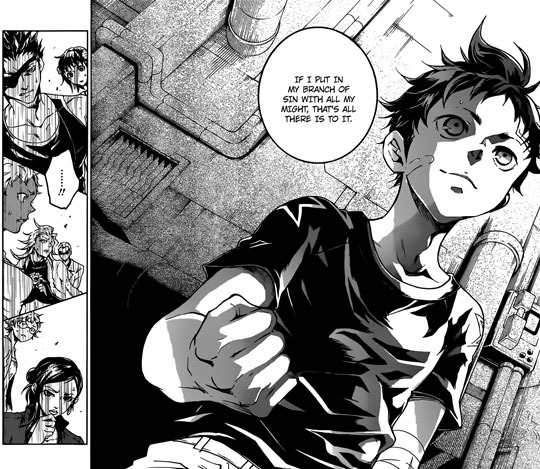 Really, Deadman Wonderland has always lied on a very thin line with me. At one point, i almost couldn’t care about the manga because i can’t help but feel it was written with the attempt to cash in on Darker is Better ploy, but at the same time, characters like Ganta and Senji are interesting enough to keep me coming back. You know, i think this would have been a much better weekly series than the monthly series it is now, cause it almost feels like it has the same problem that D.Gray-man had for a time, and while i don’t know if D.Gray-man will be getting better or not (I liked the last chapter, but not enough for me to raise my hopes) this series feels the same as D.Gray-man to me. When i was just going though the chapters in order, without stopping for releases, this was a interesting series, but when i’m left with such a gap to think about the series, and other series like it, i really find its hard not to slip away from this series. Damnit, i’m in this boat, now lets see if it sinks or swims. As for the ending, i would have to say its still a year or more off, just because there will be some end game battles and, if paced right, a year longer should be the least, at least that’s what i think personally. I think you’re right about being better during the initial readthrough, and I think that’s part of why I was able to get through this series so easily. It might be able to finish within the year if it stops with the half-length chapters. Sounds like a real love/hate relationship to me. And yeah, when something is predictably dark, it DOES seem so smug. I guess because (for me at least) when something is being predictably light, at the very least it’s an uplifting ending where something is accomplished. A predictably bad piece feels like it’s laughing at you for having hope. Though, as someone who doesn’t read the manga, I’d appreciate an explanation of what that terminology means and why it’s a bad thing. Not, like, necessarily this time, but just in the future. Even worse is that when you know how the story works well enough, you don’t really have hope, but the series acts as though you do. I suppose I should try for easier to understand terms next time. For now, I’ll explain as best as I can. The main villain has a seal keeping most of his powers in check. The only thing that can break the seal is Ganta’s ability. However, we just learned that his ability can also strengthen the seal, but the characters seem unaware of how exactly it works. So by trying to stop the villain without killing her, they may end up making her stronger. I suppose Ganta has very spoilery reasons for why the villain should be kept alive, but they still seem to be rushing into things a little quickly. I’m quite unsure about what to do with this series (if to pick it up or not), I heard from many places that there is plenty of Gore and I don’t like much that. Is this true?! Yes, there’s a lot of it. I reviewed this a little while ago, and it took some time finding pictures that weren’t too disturbing to show. For me the gore isn’t the big deal-breaker, but it doesn’t exactly help the overall feel. I’ll say. That sounds like something Shiro would say while giggling.